There is an old saying about baccarat – it is a game played by the rich to stay rich, and played by the poor to get rich. So I may have made that up, but it’s not far from the truth. One main reason for baccarat’s immense popularity is the unusually low house edge of 1.24% on Player and 1.06% on Banker (despite the 5% commission on Banker). With odds like these in your favour, it is easy to see why the super rich of the world don’t mind the odd dabble. Baccarat is in fact, regarded as the Game of Kings – and was certainly good enough for the legendary Kerry Packer and the fictional James Bond to play. In fact, rumour has it that Kerry Packer nearly bankrupted the MGM Grand in Las Vegas by playing hard and fast. So if it’s good for them it’s good enough for the rest of us. Baccarat has come a long way from its humble beginnings in the 1500s of Italy. The French tried to lay claim to creating the game, but in reality, they just made it popular during the heights of their libertine debauchery of the 1800s, when you weren’t cool if you didn’t gamble: much like modern-day Australia. Baccarat has got to be the only game in the world named after what you try and avoid in the game itself – the worst hand possible – baccarat; which translates to “zero” or “nothing”. The aim of the game, naturally (pun intended), is to win, and the best way to win is with a “natural” eight or nine: a two card total of eight or nine. Bet on ‘Player’ which pays 1:1. Wager on ‘Banker’ which pays 1:1 (minus a 5% commission). Bet on the tie option, which pays at least 8:1, but sometimes 9:1 and even 10:1 at online casinos. Four initial cards are dealt: one for Player, one for Banker, then a second for Player and a second for Banker. From here, depending on the initial two card totals, more cards may or may not be required according to the tableau. 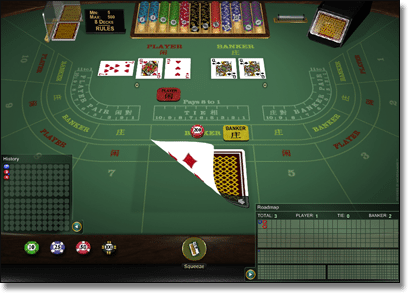 Player draws a third card if its two-card total is baccarat (0) – five. Player does not draw a third card on a two-card total of six or seven. 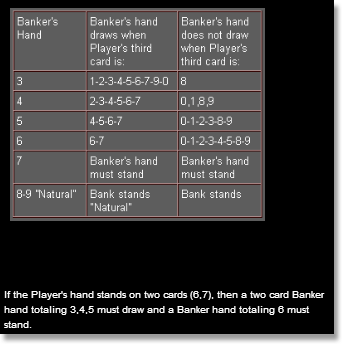 Player and Banker hands both must stand if either has a two-card total of eight or nine. 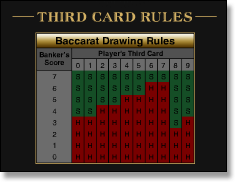 Banker draws a third card on a two-card total of baccarat (0), one and two. If Player stands, Banker hits on two-card total of five or less, stands on anything higher. Banker stands on a two-card total of seven. When the Bank’s two card total is between three and six, depending on Player’s two-card total or third card, Banker may or may not draw another card – this is where the (below) comes into play. We’ve included two tableau’s, as some prefer a sentence-style break-down (left), while other prefer a simple table (right). If both totals, at the end of play, are equal, the result is a tie. In the event of a tie, all Player and Banker bets are a push and do not lose. The tie bet is a particularly lucrative bet for the casino with an alarmingly high house edge of 14.4%, so be weary when thinking of having a bet on the tie. A handful of casinos offer another side wager – Player Pairs and Banker Pairs, and this pays 11:1 and takes in to account whether the first two cards dealt to either Player or Banker are pairs (two Kings, two Fours, etcetera). This wager is far more common online. These days though, baccarat has become more of a refined game and the favourite of high rollers the world over. However, we feel it is in everyone’s best interest to alter the image of baccarat from a a sole high-stakes game to a game players of all betting stakes can enjoy. It can still retain that elegant and luxurious feel, but players wanting to bet $5 or $10 per hand should be able to do so – and now they can. All land-based casinos within Australia have baccarat tables, but few offer low limit games. With the advent and popularity of online casinos, baccarat is now more accessible than ever and available to play for free or real money (as little as $1 per hand) via the top-rated online casinos recommended in our casino table above – play via your smartphone, tablet or Smart TV, too. These trusted interactive casino sites offer baccarat in every form known to the World Wide Web, and the good news is each provides a handy AUD welcome bonus. Each of the above recommended gambling websites have their own preferred methods to deposit and withdraw Australian money, such as credit and debit cards, e-wallets, instant banking and pre-paid cards. Now if we get down to nitty gritty maths of baccarat we see that the probability of Banker winning is 45.84% whereas the likelihood of Player winning is 44.61%. Going on these numbers alone there is a strategy – if you could call it that – to just bet Banker and you will come out ahead. This however, is a flawed strategy because it is all based on statistics and theory which is all well and good on paper, but in the real world the cards don’t always fall according to the stats. There is also a cheeky little strategy called the Martingale Strategy. Due to the 5% commission on Banker it isn’t really effective for use on Banker but is great for Player. The strategy goes that if you lose, the next hand you double up until you win. For example if you lost a $50 bet on Player, the next hand you would bet $100 on Player, thus covering your loss and giving you a $50 return. If you were to lose your $100 bet, you would then bet $200 on Player, a win would cover your total $150 investment and a $50 profit. The only shortcoming of this strategy – it works on the premise you have an infinite wallet. I do not have an infinite wallet though… However you decide to go about attacking the baccarat tables, good luck. Let’s hope you manage to pull a Kerry Packer and break the casino.